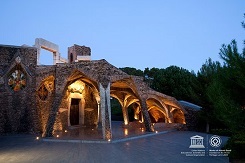 The project, as numerous others, was ordered by Eusebi Güell, a patron and friend of Gaudi. Güell was a businessman, from a wealthy family, who had the opportunity to travel and study in Europe. He has then the opportunity to meet Gaudi during the Paris World’s Fair, of 1878 and to discover the british industrial model. Eusebi Guell inherited the textile company form his dad, but he was more interested in the well being of his employees. When social conflicts arise in Barcelona, he decided to move his factory to Santa Coloma de Cervelló. Thanks to his friend and his opened mind on new industrial method, the Colonia’s project was born. The main aim of Güell was to improve the living conditions of the workers. He decided to create a city out of the factory and add his cultural patronage. Different architects worked on this project, the one of the most famous being Gaudi. Colonia: you can walk through the industrial Colònia and admire the typical modernist architecture. Modernism is Catalonia is the mix of typical material and new ones, for example, brick walls and iron. You will discover the different function of the building, from the farmers house to school or theatre. The Ca l’Espinal is one of the most remarkable building. Gaudi’s crypt: Gaudi and Güell were attached to religion and so, decided to build a church in the Colònia. However, as the Sagrada Familia, this work was unfinished before Gaudi’s death. Remains the crypt, a perfect example of Gaudi’s architectural mastery, with a combination of his different techniques. Exhibition: to fully understand the Colònia, visit the exhibition! You will discover here how the people used to live here and learn more about Gaudi’s architectural work. Farmer’s market: on Saturdays’ morning, you can enjoy a local market, built around seasonal organic fruits. The perfect plan if you want to have a picnic during your visit. The opening time differs depending on the season. Winter season is from the 1st of November until the 30th of April. It is opened from 10am until 5pm on weekdays and from 10am until 3pm during the weekends. Summer season (1st of May until 31st of October), the Colònia is opened from 10am until 7pm on weekdays and from 10am until 3pm during the weekends. Closing days: 1st of January, 29th of March, 3rd of April and 25th and 26th of December. By train: departing from Aparthotel Mariano Cubi, take the line 3 (green one) from Fontana (10 min walk) to Plaça Espanya and then take the R6/S3/S4/S8/S9, depending on the first one to arrive. You have 20 min of train and 15 min walk when you arrive (look for the blue track). From Aparthotel Senator, you can follow the previous itinerary (the walk to the subway is a bit longer) or you can take the line S2 to Catalunya, then the line 1 (red one) to Plaça Espanya. Then, the train is the same and follow the blue track. If you go there during the weekend, the train is decorated with Gaudy’s crypt. By car: your travel time depends on your starting point. However, our aparthotels for family in Sarrià, it will be 25 min. Don’t hesitate to ask the front desk for further information about the itinerary. A parking lot is reserved for the visitors once arrived. You can go to the visitor center once arrived to plan your visit through the Colònia. Usually, the first place visited is the exhibitions, where kids can watch a video detailing the daily life of workers seen through the eyes of a young girl, Eulalia. You can also enjoy green spaces along the visit and a pine forest near the church. Some themed visits are also organised from time to time, contact the visitor center for more information. Children under 10 have free entrance. For adults, prices varied between 5,5€ to 11,5€. You can have audio guides but also guided tours. Special discount can apply to family or young children, contact them for more information. The Colònia Güell is a great example of Modernism architecture. If you want to have a break from Barcelona by enjoying a day trip, this is made for you! Enjoy your stay in our familial aparthotel in Barcelona!